Mix the salt and sugar, put ⅔ of it in the dish, make 4 wells using the back of a spoon. Carefully place the egg yolks in the wells, gently cover with the remaining salt and sugar mixture. Seal the dish well, then chill for approx. 12 hrs. Remove and rinse. Combine the meat, radishes and radish greens and all other ingredients up to and including 1 tbsp oil and lime juice, season. 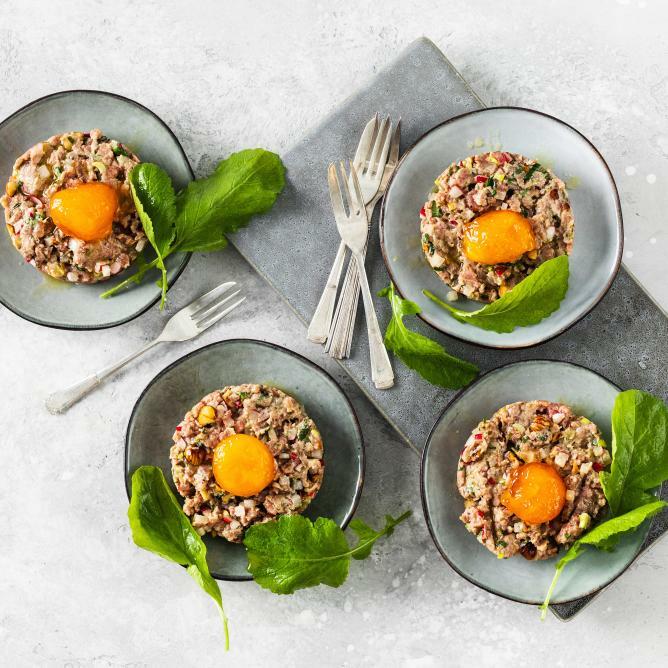 Serve the tartare on 4 plates, place an egg yolk in the middle of each. Mix the remaining oil and lime juice, season with salt, drizzle on top. If you chill the egg yolk in the salt and sugar mixture for up to approx. 1 day, the egg yolks will be even firmer.